At the convention of the United Russia party in Moscow, President Dmitry Medvedev proposed Prime Minister Vladimir Putin as the party's candidate for the presidency in 2012. 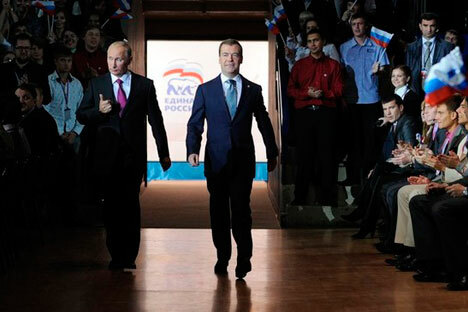 At the convention of the United Russia party in Moscow, President Dmitry Medvedev proposed Prime Minister Vladimir Putin as the party's candidate for president in 2012. “I consider it to be the right move for the congress to support party’s leader Vladimir Putin as a presidential candidate,” announced Medvedev. For his part, Vladimir Putin, who is the leader of the United Russia party although not a member, called on the delegates to put Dmitry Medvedev at the top of the list of candidates at the forthcoming parliamentary elections in December. President Medvedev complied with the request to head the election list of the United Russia Party and explained the move by saying, “The Party has been actively supporting the presidential course. "I'm ready to continue my work to modernize the country in the government," Medvedev said, accepting the request. "It will be a radically revamped government." “The decision we promote to the congress is a circumspect one and even more than that – we actually discussed this possibility when the tandem had just been formed,” Medvedev said, pointing out that the correctness of the chosen strategy has been proven over years. However, Putin said that neither himself nor Medvedev are pre-occupied with the positions they hold. “Much more important is what we all do, what results we get and the opinion of the citizens about all this,” Putin said. “Modernization of the economy, political system and social life – this is our marathon. This means we have a common understanding of the future for our country. We have vast common plans for the future, common answers to the most challenging questions our state faces – and this is above all. In his address to the party, Putin proposed aims for the future of the country that sounded like the beginning of a presidential campaign. Putin stated that one of the main aims for the government is to increase the rate of growth of Russia’s economic development, up to 6-7 per cent per year. Putin noted that Russia’s current economic growth is around 4 percent, while in more developed countries it increases by 1-2 per cent per year. “But this should not disorient us, by absolute volumes that 2 percent is higher than our 4 percent,” he said. Putin also said that substantial independence of Russia in terms of food stocks will be reached during the next five years and set the task of fully re-arming Russian armed forces in five to 10 years. “During the next five to 10 years we need to completely re-arm Russia’s army and navy,” Putin said. Changes made to Russia's election laws in 2008 extended the presidential term from four years to six, which means that the person elected next March will remain in power until 2018.